We are one of the reputed manufacturers and suppliers of wide range of Industrial Threads. 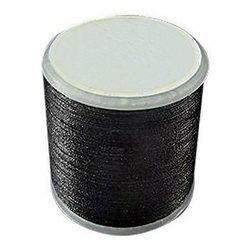 In this category, we offer Umbrella Threads, Tarpaulin Threads, Notebook Threads and Lace. We use highly sophisticated machines and instruments in manufacturing of these products. Our extensive range is made of superior quality of raw materials such as polyester, raw cotton and natural fibers to meet the diverse requirements of industry. Our enterprise manufactures and supplies Notebook Threads, which is made of superior quality Cotton and polyester yarns. The threading material is offered by us in number 24 and number 2. Our range is used in notebook, dairy and registers manufacturing processes. The extensive range of our company is widely acclaimed in the market for the elegant finishing, superior coating and durable finish standards. 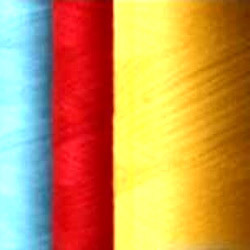 Our company offers Glace Threads in fast and bright colors. The thread product is manufactured with superior grade combed cotton material and extensively used in the handicraft industries for design of artistic dresses, carpets and covers. Our range is appreciated in the market for smooth coating, free from surface grain, knots & hairiness, customized sizes and economical prices.